Non-native Phragmites australis has invaded over 60,000 acres of Great Lakes coastline and continues to expand inland. Phragmites management is widespread, yet treatment effectiveness varies due to infestation level, application methods, environmental conditions, and many other factors. The Phragmites Adaptive Management Framework (PAMF) is a program designed to reduce uncertainty in Phragmites control by using an adaptive management paradigm focused on learning from management outcomes. Through a systematic approach, PAMF works with partners across the basin to refine best management practices and provide site-specific management guidance. After year one, over 300 acres were enrolled in PAMF across four states and one province. Management combinations considered in PAMF’s data-driven model showed various signs of success in reducing Phragmites infestations, including herbicide and non-herbicide techniques. Site-specific guidance was provided for 85 management units for the next annual cycle. Participant involvement in data collection is critical in driving this collective learning process. 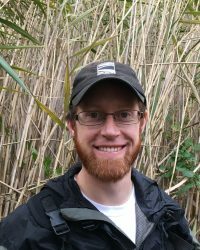 Dan is a biologist for the Phragmites Adaptive Management Framework (PAMF). His love for the outdoors goes back to his childhood days spent playing in the creek behind his parents' house and chasing bass on a lake in northern Michigan. He earned his master's in conservation ecology and environmental informatics from the University of Michigan School of Natural Resources and Environment. Between graduation and his current position with PAMF, Dan was crew leader for the City of Ann Arbor Natural Area Preservation, volunteered for the Huron River Watershed Council, and coached middle school soccer in Detroit. In his free time, Dan enjoys hunting, birding, running, and playing peek-a-boo with his daughter.